Blake Starwater and the Adventures of the Starship Perilous #2. 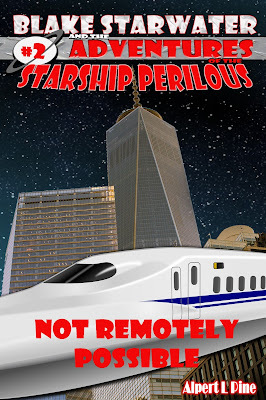 Blake Starwater is captain of the starship Perilous. Traveling along with him are the frisky Felioness, Kitty, and the cynical robot, OMBot. Together they soar between the numerous Known Worlds, taking on the jobs that other space crews won't do. The risky jobs. The dangerous jobs. The sometimes less-than-legal jobs. The crew of the Perilous is sought out for the skills of their former systems adept, Lillian Stone. Undeterred by her absence, the furry client offers them the job anyway, albeit now slightly altered. Instead of breaking into a corporate computer system, they'll be breaking directly into the company's headquarters. Lives are on the line as the crew attempt to help expose a corrupt political candidate and a deadly technology being rushed towards completion. Can Blake and Kitty manage to infiltrate the high-tech company undetected, or will their subterfuge be exposed? An intoxicating tale of conspiracy and suspense! Blake Starwater and the Adventures of the Starship Perilous: Adventure #2.